Firefighters extinguished the fire before it spread. Photo courtesy of Fire District 7. Emergency dispatchers received multiple reports of a dumpster fire at the 15500 block of Mill Creek Boulevard on Sunday evening. Firefighters arrived and found that the fire was spreading quickly into the attic space of the adjacent 14 garages at the apartment complex. Ladder 72 arrived and cut a ventilation hole in the roof to allow the smoke to escape, while additional crews worked to gain control of the fire and extinguish the flames. 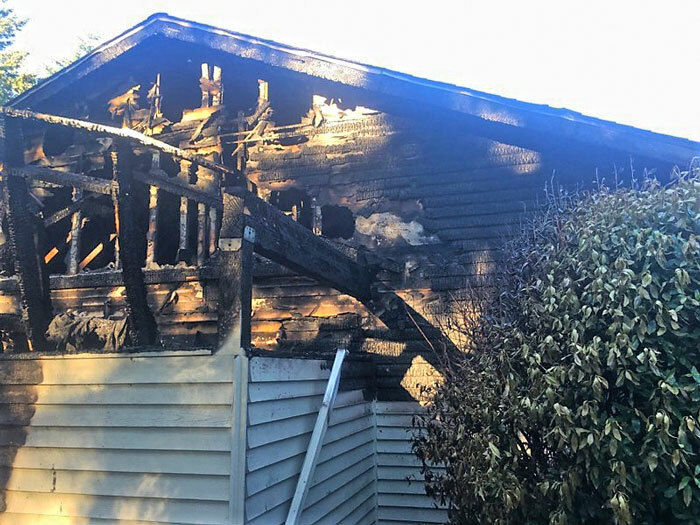 Due to the quick fire attack and ventilation, firefighters were able to contain the fire before spreading through the garages and causing additional damage. The garages were not attached to the apartment building. No injuries were reported. Snohomish County Fire Marshal is investigating the cause of the fire and determining the amount of damage. The fire marshal is investigating the cause of Sunday's fire. Photo courtesy of Fire District 7.